China OKs 38 Trump Trademarks; Critics Say It Violates Emoluments Clause : The Two-Way The Chinese Trademark Office had denied Trump those naming rights for a decade even as Chinese-owned businesses used his name without paying licensing fees. 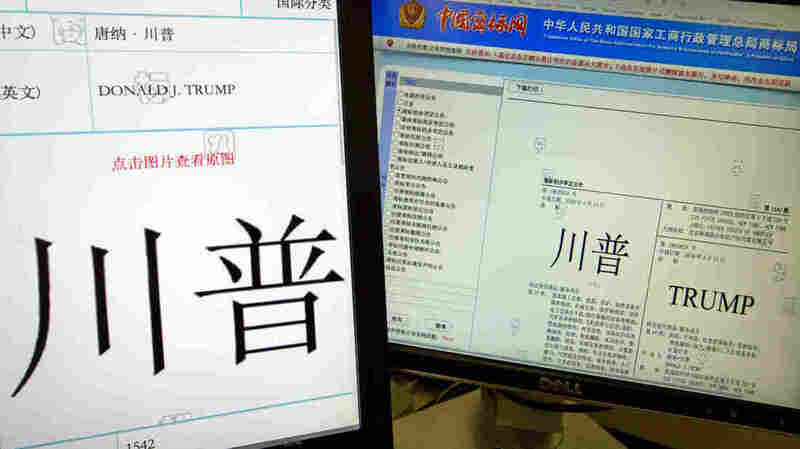 Computer screens show some of the Trump trademarks approved by China. President Trump is on his way to getting something he has wanted for a long time: dozens of valuable "Trump" trademarks in China. China's Trademark Office has now given preliminary approval to 38 new trademarks, covering everything from hotels to golf clubs, insurance and more. After AP reported the news Wednesday, Senate Democrats expressed outrage, noting that Trump's lawyer Sheri Dillon had promised in January that there would be "no new foreign deals" during the Trump presidency. But by pursuing new trademarks, the Trump Organization, which the president continues to own, may be laying the groundwork for expansions in China. Maryland's Ben Cardin said, "For a decade prior to his election as president, Donald Trump sought, with no success, to have lucrative and valuable trademarks granted in the world's biggest market. He was turned down each and every time. The floodgates now appear to be open." Cardin called on the federal departments of Justice, State and Commerce to "brief Congress, immediately, on these matters and on the potential constitutional dangers that they present." Cardin is concerned about violations of the Emoluments Clause of the Constitution, which bars elected leaders from taking anything of value from foreign countries, unless approved by Congress. Dianne Feinstein of California said the trademark approvals are "exactly what the Constitution's Emoluments Clause was designed to prevent, and President Trump is blatantly defying it." Last month, China approved one registered trademark for a Trump-owned construction services business. Kathleen Clark, a government ethics professor at Washington University in St. Louis, told NPR at that time that by giving Trump valuable name rights, Chinese officials may hope they can influence policy decisions. And that represents a breach of the Emoluments Clause, she believes. "What I think this demonstrates is that when Donald Trump is dealing with the Chinese government on behalf of the United States, he also may be thinking about what the Chinese government can do not just for the U.S. but for Donald Trump and his businesses and his own financial well-being," she said. The Trump Organization says it pushes for trademarks to prevent others from using them. "[W]e zealously protect Mr. Trump's valuable name, brand and trademarks," Alan Garten, chief legal officer for the Trump Organization, told The Washington Post in a statement. Trump has been trying for a decade to nail down trademarks in China for a wide range of goods and services, including pet care products, lingerie and computer software. The Trump Organization has been frustrated that many Chinese-owned businesses have used the name "Trump" without paying any licensing fees. The applications for these particular trademarks had been filed last April during the heat of the presidential campaign when Trump was claiming that China steals U.S. jobs. AP says China's Trademark Office published the provisional approvals on Feb. 27. If no one in China objects, they will be automatically registered after 90 days.